For me the best gardens have a sense of place. Structures and plants can provide cues to what region a garden is located in. I especially like gardens where the garden structures are constructed by local carpenters from local or regional materials. 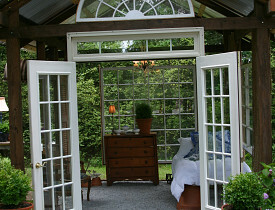 In the southern United States the long growing season and mild winters afford maximum opportunities for outdoor living. This translates to decks, gazebos, arbors and garden houses. They can be formal or informal depending on the style of the house and the garden. Arbors connected to the house, with one section that has a roof, provide welcome relief from the intense summer sun or rain while open sides encourage good air flow. The addition of ceiling fans helps to keep people cool outdoors. The location, off the back of a house with a stone patio, makes for easy access for entertaining and relaxing. In many parts of the south, red cedar, Juniperus virginiana, is a popular choice of material for free-standing arbors. Arbors can be both functional and decorative, serving as a support for climbing plants like roses and vines. They can also act as a welcoming entrance to a garden or part of a garden. An easy way to make a small garden seem larger is to use an oversized arbor. Wood fences, gates and arbors made of cedar or pressure treated wood that is painted or stained are also common. White is a popular color to paint arbors and fences. Structures made of stone or a combination of stone and wood are durable and long lasting. This includes gazebos, gates, columns, posts and walls. Brick and granite are plentiful in many parts of the South, and a combination I like is a wooden gate with brick or stone columns. In some parts of the south, like Charleston, SC and Savannah, iron gates and fences are popular. You'll even see them in Atlanta, where Atlanta fence contractors have been building them for many years. Garden houses made from recycled wood doors, windows and window frames provide a place to relax and enjoy the garden in a free standing structure within the garden. Outdoor curtains provide an elegant touch and offer a way to provide additional shade. Tin roofs are inexpensive and are sometimes selected for not only looks but for the great sound effects that occur when it rains. I know of one gardener in Georgia who constructed an outdoor living room with large windows (the glass was removed) on top of a wooden deck. The room is furnished with old fashioned gliders and there is even a fully operating electric chandelier that hangs from a large oak. Raised up from the ground, this outdoor room adds additional space to entertain and relax in the garden. It’s also easy to keep clean. Screened rooms or porches that have roofs can be large or small, depending on the size of your house and garden. In the south, the screen porch is like having an extra room with all the benefits of outdoor living as well as a great way to escape mosquitoes and other insect pests.